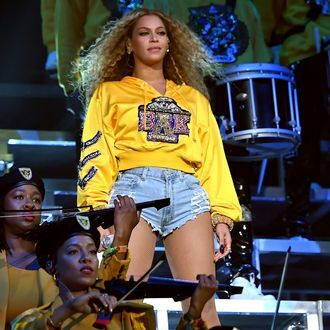 Coachella 2018: Does Beyoncé Have Another Set For Weekend 2? Does Beyoncé Have a Different Set Planned for Coachella Weekend 2? According to that BTS image, “Upgrade U,” “End of Time,” “Bills Bills Bills,” “6 Inch,” and “Cater 2 U” might be in store for weekend two’s crowd. (This doesn’t necessarily ensure another Destiny’s Child reunion — Bey previously did her “Cater 2 U” and “Bills” verses solo during The Beyoncé Experience tour.) Think of all the hits Beyoncé just teased us with this past Saturday night: “Party,” “Ego,” “Shining,” and “Blow,” were only referenced by her “Beyoncé Alpha Knowles” pledges or allowed brief instrumentals during her weekend one set. (Think of all the songs that didn’t even make it in: “Freakum Dress,” “All Night,” “Naughty Girl.”) Will we get a “Grown Woman” performance live? And if Jay-Z joins Beyoncé onstage for “Upgrade U,” will he remember his whole verse? Per Billboard, Coachella’s second weekend won’t be livestreamed. Does Beyoncé Have a Different Coachella Set for Weekend 2?